Alcatel-Lucent worked with Trinity College Dublin (Ireland) and the City University of New York – College of Staten Island to investigate a novel micro-textured thermal interface material. 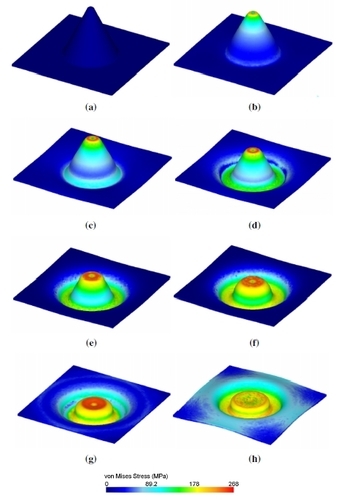 Technical support on the model development for the microforming simulations was provided by Wilde Analysis. This research successfully tested the use of DEFORM for a product 100 times smaller than typical applications. Thermal interface materials are used to improve heat transfer between contacting surfaces when good heat transfer is needed, such as between computer chips and cooling fins. Without such an interface material, inherent surface roughness and waviness creates air gaps which impede conduction. Alcatel-Lucent worked with Trinity College Dublin (Ireland) and the City University of New York – College of Staten Island to investigate a novel micro-textured thermal interface material. The micron scale egg crate-like sheet is made from an excellent thermal conductor such as silver. Under clamping, the peaks plastically deform. As the peaks are crushed, the surface conforms to the contacting surface and improves thermal coupling. The shape of the load vs. deformation curve is a key piece key piece of information required for testing and design optimization of the surface. Fig. 1: Concept of metal micro-textured thermal interface materials in compression between two solids. Effectively optimizing the size and geometry of the surface texture features requires an understanding of the compression and buckling behaviour of the peaks. Early mechanical models did not match experimental results well. 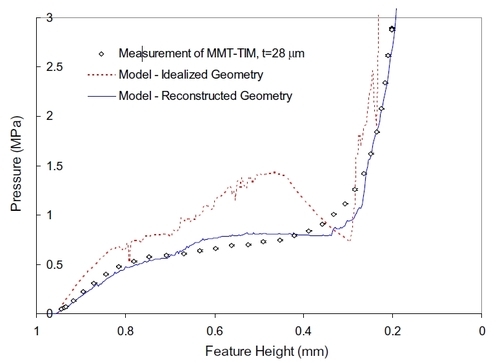 Initial finite element models based on idealized peak shape did not capture the complex buckled shape seen in physical tests. 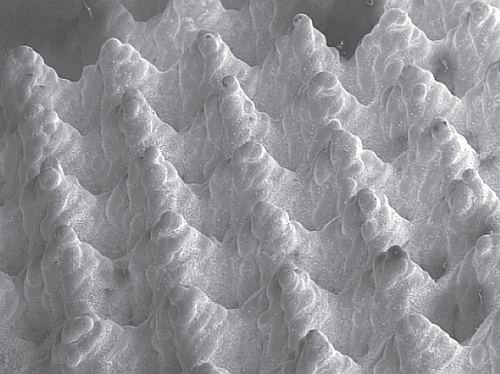 To accurately characterize the shape of the peak features scanning electron microscope (SEM) stereomicroscopy was used to measure the surface. 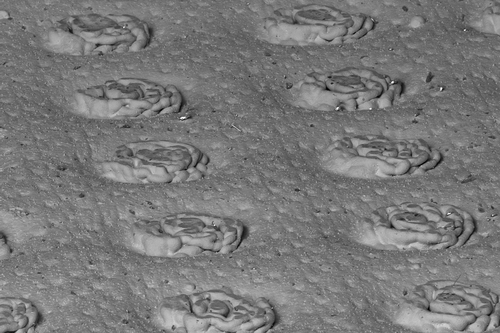 MeX image processing software (Alicona Imaging, GmbH) was used to reconstruct a 3-dimensional surface from the SEM images. 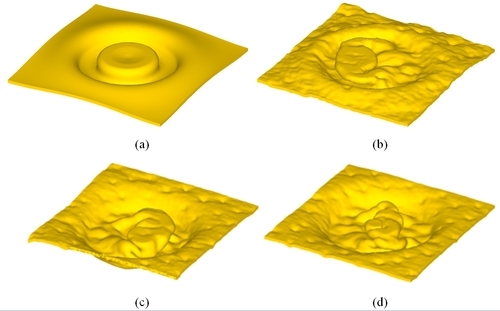 MATLAB (Mathworks, Inc.) was used to convert the surface into a solid suitable for DEFORM-3D meshing. Fig. 2: SEM image of the double-sided MMT-TIM. Because the goal of the current project was to study buckling behaviour and compression loads, the rigid-plastic material model was adequate. The test material was 99.99% pure silver. A flow stress curve was derived from a standard compression test. A single unit cell geometry was studied, with symmetric boundary conditions assigned to all four sides of the cell. Model sizes of around 150,000 elements were found to provide adequate geometric resolution. Self-contact and local remeshing were used to ensure correct behaviour as the surface buckled on itself. For comparison, an idealized unit cell geometry was constructed with a CAD system and simulated using the same procedure. The scanned shape gives excellent qualitative comparison with physical tests. Load-stroke curves also match within 15% of the measured curves. Of note, the idealized shape exhibits substantially different compression behaviour. The irregularities present from manufacturing precipitate the non-uniform buckling. This research shows a novel use of DEFORM for a product 100 times smaller than typical applications. Despite the size difference, key principles are highlighted. DEFORM is capable of matching results of physical testing very well, but the result is dependent on input data. Idealized inputs tend to yield idealized results. While not every simulation requires measurements with an electron microscope, consideration of variability in billet shape, temperature, lubricant, location, alignment and similar factors will yield improved results in any simulation. Please contact us if you have any difficulty locating this article.